James Williams will be teaching a tameshigiri and aiki jitsu seminar at Lincolnton Aikido & Fitness in Lincolnton NC. This seminar will encompass both beginning techniques for first time students and advanced cutting and drawing techniques for more experienced practitioners. First time and beginning students will be taught safe and effective drawing and returning saya, proper cutting motions, effective angle of attack of the sword when cutting, and techniques for basic cuts as well as proper grip, body alignment and distance to target,. More advanced practitioners will learn how to cut from the draw with power, effective multiple cutting, and one handed multiple cutting. Techniques for both combative and tournament style cutting will be taught and demonstrated. Our perspective on tameshigiri is that it is a practical art that must able to be applied in a functional manner. There will be personal, hands on, instruction for ever participant at every level. 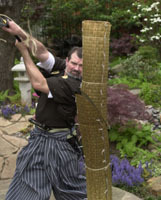 The entry fee of $150.00 for the tameshigiri only will include 10 rolled and soaked targets, 5 single rolls and 5 double rolls, of Bugei wara for each participant More targets and larger targets may purchased in addition to the those provided for by the basic seminar fee. If you are interested in more or larger targets you must let us know before the deadline below. There will be opportunity to ask the how and why of techniques, sword design, sword care, etc. Participants will be able to test various Bugei swords to get a feel of how different swords cut. Seminar will be limited to 25 participants so register as soon as possible. Deadline for registration is no later than August 30.